The purpose of this rich and innovatively presented ethnography is to explore mobility, sense of place and time on the British Columbia coast. On the basis of almost 400 interviews with ferry passengers and over 250 ferry journeys, the author narrates and reflects on the performance of travel and on the consequences of ferry-dependence on island and coastal communities. 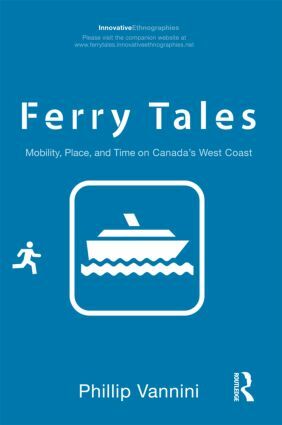 Ferry Tales inaugurates a new series entitled Innovative Ethnographies for Routledge (innovativeethnographies.net). The purpose of this hypermedia book series is to use digital technologies to capture a richer, multimodal view of social life than was otherwise done in the classic, print-based tradition of ethnography, while maintaining the traditional strengths of classic, ethnographic analysis. Phillip Vannini is Associate Professor in the School of Communication and Culture at Royal Roads University, in Victoria, Canada, and Canada Research Chair in Innovative Learning and Public Ethnography. He is author and editor of eight books including Understanding Society through Popular Music (with Joe Kotarba), and The Senses in Self, Culture, and Society (both published by Routledge). The purpose of this series is to use the new digital technology to capture a richer, more multidimensional view of social life than was otherwise done in the classic, print tradition of ethnography, while maintaining the traditional strengths of classic, ethnographic analysis.